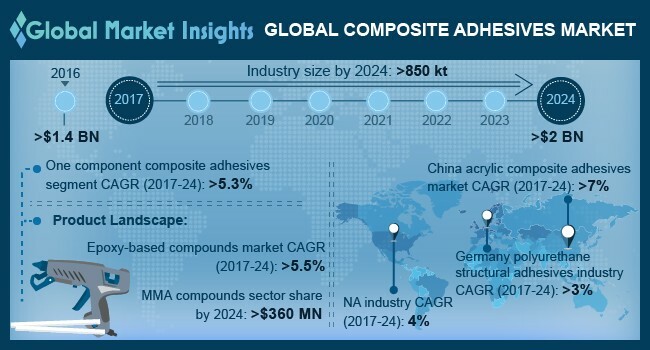 Composite Adhesives Market size should surpass USD 2 billion by 2024; according to a new research report by Global Market Insights, Inc.
Acrylic composite adhesives demand will witness significant gains at over 5% during forecast period. This growth in demand for acrylic based products can be ascribed to its increasing application scope in binding truck hoods, raised-roof assemblies and in automobiles to bond composites for roofs, doors, liftgates and hoods. Acrylics offer high bond strength on plastics, composites & metals and performs well even on oily surfaces at lower surface temperature than epoxies. Rapid industrial & infrastructural growth along with increasing renovation project incurring huge spending in Brazil, India, Vietnam and China should bolster demand for composite materials thus driving structural adhesives market size. Shifting trends towards adopting composites replacing traditional building materials like brick, wood, mortar and stones should further strengthen industry growth. Composite adhesives are used to bond materials which need to withstand high stresses and loads without compromising structural integrity. MMA composite adhesives market size should surpass USD 360 million by 2024 owing to its ardent demand in aerospace industry. Its fairly high tolerance to poor surface condition (such as oil contamination), high strength performance, greater freedom of material choice like metals, magnets, glass, wood and composite along with bondability with dissimilar materials as well as improved finish should drive product demand. North America, led by U.S. composite adhesives industry size, is anticipated to grow at a rate of about 4% during projected timeframe. Rising utilization of composite adhesives in medical devices, cascade for engine, leaf spring, machinery and welded tube application should drive industry growth. Growing demand for high-quality composite adhesive which offer superior properties should fuel regional product demand. Composite adhesives industry size from dental application should grow at a rate of over 4% during forecast period. The combination of adhesive composite resin and acid-etched enamel affords the benefits of reducing or eliminating microleakage of the enamel margins along with reducing sensitivity, lowered discoloration of margins, lower rates of recurrent margins and improved retention of restoration. Global composite adhesives industry share is fairly consolidated with participants including 3M, Henkel, Permabond, Sika AG, LORD Group, Bostik, SciGRIP and Covestro. Other key industry players include Hybond, Gurit, Huntsman, Argosy, Allnex, Solvay and ASI. Companies manufacturing these adhesives focus to enlarge their production capacity by investing on facility upgradation. They also adopt strategies like merger, acquisition and partnership with other players to enhance their product application portfolio through increasing R&D spending.